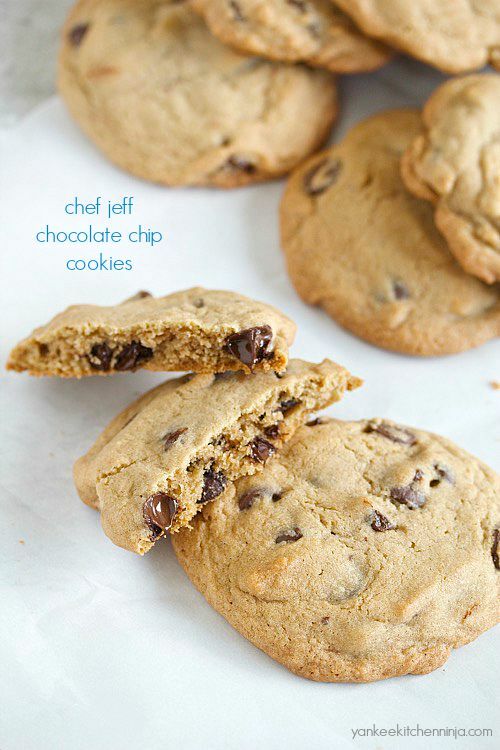 Jeff Sadowski, a former on-campus chef and more recent cookbook author, is said to have started making his famous chocolate chip cookies available for sale when he transferred from in-dorm chef to manager of the remodeled campus center central cafe in the late 1990s. These cookies have become the stuff of legend, for their unique blend of crunchiness (around the edges) and chewiness (in the middle). So, being The Ninj, I tracked down Sadowski's recipe to see what all the fuss was about. Bottom line? It's not fuss. It's truth. 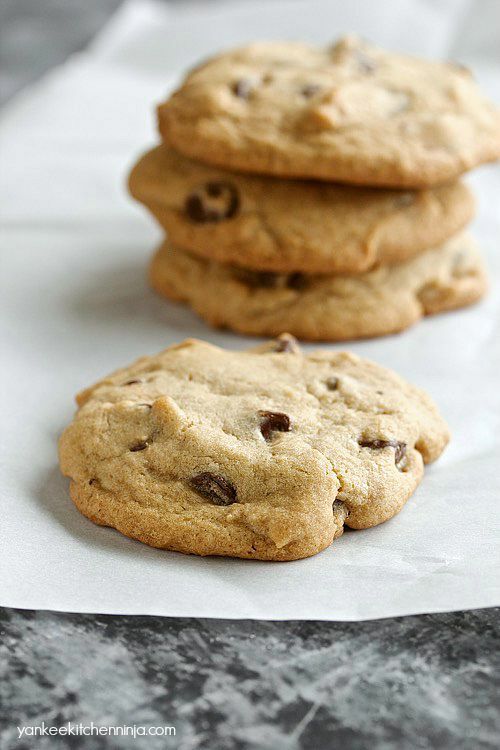 Now, many of you will be quick to point out that the recipe is quite similar to the traditional Toll House cookie recipe -- and you're pretty much correct. However, I think the biggest difference and Sadowski's secret is in the mixing: you must cream the butter and sugar for a lot longer than you would think (I've heard 10 minutes, but, being all Type A, I lost patience at about 6 -- maybe you are more Zen). Also, it's key to remove the cookies from the oven before they really look done. Trust me: that's how the centers remain chewy. So be sure to watch for just the slightest browning around the edges and then yank 'em outta that oven to cool. So far, I've had the honor of making these Chef Jeff chocolate chip cookies for not one but two different groups of Mount Holyoke alumnae, some for whom they were a regular college staple and others for whom they were a brand new treat. Both agreed that they are a tradition worth preserving. Did you have any unique food traditions at your alma mater, as I did? Leave a comment: The Ninj wants to know. In a bowl, whisk together the first four ingredients (flour through salt) and set aside. Cream together the sugars and the butter, using a mixer, until very light and fluffy (optimally, this should take between 5-10 minutes!). Add the egg and vanilla and mix until well blended. 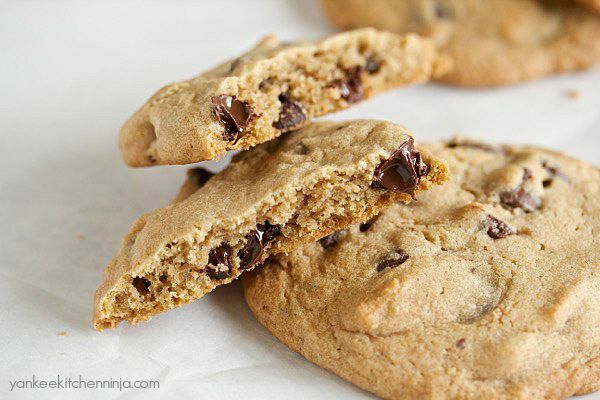 Gradually add the flour to the butter mixture, followed by the chocolate chips, and mix until blended (do NOT overmix). Spoon the dough onto a prepared baking sheet, spacing the cookies several inches apart, as they will spread. Bake for *about* 10-11 minutes, or until the edges just begin to brown but the centers are not completely cooked. Cool for a minute on the pan then place cookies on a wire rack to cool completely. Makes 12 large cookies. Ha ha ha, glad I'm not the only impatient one! Hope you give these cookies a try, Allie -- thanks for stopping by! I was lucky enough to experience both dorm dining and Chef Jeff cookies. Can't wait to try this! Doubly lucky, Danielle! Enjoy the cookies.